Capcom, constantly in order to revive good things from the past, did not take its customers for jackasses. 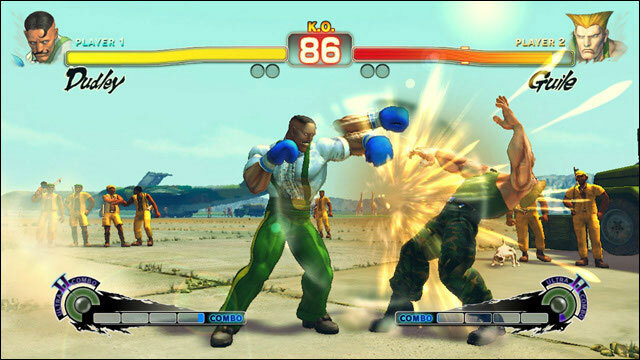 In only two years, they released no less than three versions of a 'same' game: Street Fighter IV, Super Street Fighter IV, and Super Street Fighter IV Arcade Edition! 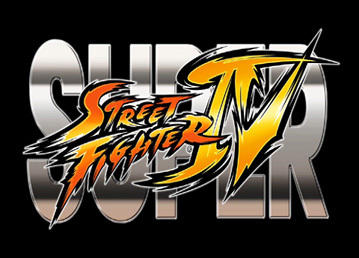 For now, here's the full review of Super Street Fighter IV. We're joking, but the work done by the editor is still remarkable. 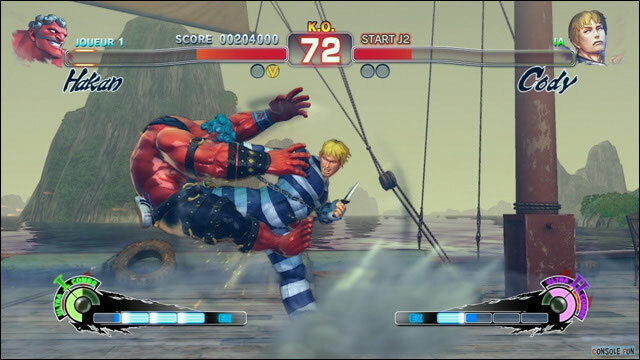 Since Street Fighter IV, programmers have designed new high definition 3D graphic engine, while preserving the unique 2D gameplay. Everything is made of polygons and textures, characters, backgrounds, and all elements therein. And putting an end to the unbearable suspense, the result is divine. Not less than eighteen stages, evolutives and varied (different times of day, weather changes, etc.) are available. Note that these are particularly lively, as rarely seen before. Either element interact with fighters or other characters doing something, or an action happening... it's enjoyable to watch, especially since the line is remarkably neat. The 3D characters fit perfectly in backgrounds, as diverse as they are. Ryu, Ken, Honda, Blanka, Sagat, etc ... The whole gang of Super Street Fighter II X is back, with some new ones and even warriors from other Capcom games. Scenario is surprising but consistent with the old series, since characters such as Gouken, the master of Ryu and Ken- appears, Dudley making it back from SFIII, Adon from Street Fighter or even Guy, appeared in 1989 in Final Fight. Chronologically, this "IV" saga takes place between SFII and SFII. Yes, character design is great: faces of the protagonists in intermediary screens, or the warriors themselves, are beautiful and massive, with great textures and filters on them. The design from Street Fighter II was used as a base for the transition to 3D. However, most of the protagonists have been bodybuilding a little: Honda, Zangief or Sagat are now huge in muscles: like it or not! Even crossbows as Balrog (the Spanish) or Dhalsim look on steroids. Anyway, that Super Street Fighter IV is graphically very impressive. Alive stages are great... but characters moving with fluidity and quickness, it's even better! And we have nothing to complain about, since the animation is up to the nice graphics. Players move smoothly and show very decomposed frames. Camera angles change when you perform a special attack or a throw, for example. With the 3d and skillful management of it, the game reaches a new visual dimension, without harming anyhow the gameplay. Effects during combos, SDM and other pyrotechnics are impressive: fireballs are striking beauty and the various filters applied during the action are fantastic. Minimalist pixel art lovers will skip their turn for sure, but here again, we're near perfection. The sounds of blows remind heavy impacts from SFII, while we've never heard so many voices in a fighting game! Musically, it's good with a lot of mythic themes remakes and nice new tracks. However, the soundtrack is not as significant as the legendary 1991's one. The main addition in Super Street Fighter IV compared to Street Fighter IV, is a good thick slice of additional characters. From twenty-five core fighters, game expands up to thirty-five selectables! A great add, especially when experienced players have the pleasure to find warriors like Adon, Dudley, or DeeJay... but also some good assholes with no charisma, like only Capcom has the secret. Hakan is a newcomer, but we also have ridiulous Cody and of course T-Hawk to name a few, who have missed to many players... or not. Whether you are a fan of the roster or not, this one is impressive. And to top it off, each fighter has a wide range of moves and combinations, as you guessed. Seasoned players will quickly find their marks, but progress through new mechanisms and special moves, combos, will take time. And you get to the gameplay. Capcom make the player feel like on its 90's arcade. In addition to the three + three buttons configuration, 2 new buttons are added, to perform throws and the new focus attack: it's another move different from the others, unblockable and which intensity can be increased by holding the button down. Combine three buttons simultaneously during some special moves multiplies power. A good base so full, perhaps too much. The game is also packed with new combos while quite few special moves have been added: for example, Guile is quite the same as in SSF2X. Before beginning the fight, player chooses between two super special moves. These are triggered when the super bar is full, nothing new here. If you ever played Street Fighter II, III or Zero , you might find your marks instantly. The game is not particularly fast, but more technical than its ancestors, without going as deep as Kof XIII. 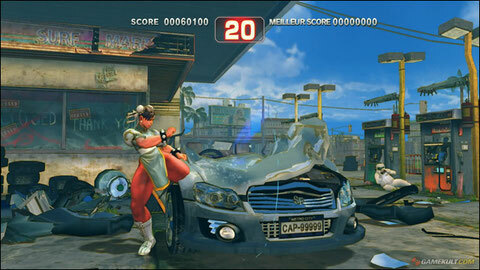 Capcom provides a tutorial mode in addition to the arcade classic, versus and online games: perfect for training! As usual, the editor has finely tuned his game, and it's full of nice details and winks that put the smile on every VS Fighting fever's face. Known fighters, sometimes from other Capcom games, pass quietly in some backgrounds, some stages' details and events are also 'easter eggs' to discover. Another thing that will delight aficionados, Bonus Stages are back! You get the good old car destruction (in Final Fight's bonus place!) And the barrels falling from the ceiling... great! In short, between the pleasure of discovery, wonder at the magnificent realization, the extensive roster and gameplay with its large room for improvement, it was worth our money. 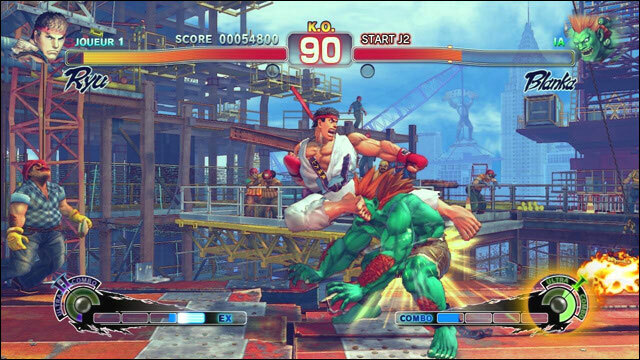 Super Street Fighter IV is a VS Fighting must-have, a worthy successor to its glorious ancestors. Capcom chooses to use 3d graphics for a 2d gameplay: the result is sublime, using powerful 128 bit hardwares! Stages are alive and evolutives. Impact effects and characters' animation are near perfect: a little more nervosity would have been perfect. Very very varied and powerful impact noises, while musics are just doing the job... For a top-notch soundtrack! Thirty-five fighters in the game, a story for each of them, many game modes and endless online fights: it's perfect! Sensations offered by old Street Fighter games are felt here plus the numerous innovations. But... eight buttons, it's too much! 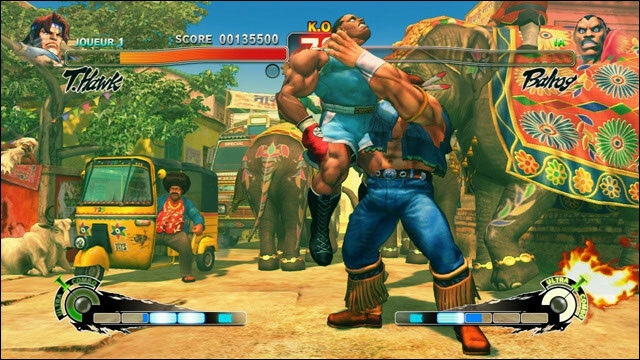 SSFIV is a hymn to VS Fighting: fantastic realization, rich and deep technical gameplay... Thank you Capcom!